Not long ago, buying a set of golf clubs simply involved visiting our local golf shop and purchasing a set right off of the floor. All clubs were made to the same standards. The biggest choices to make were regular or stiff flex shaft made of steel or graphite. Today, every company offers some form of fitting process to ensure the clubs you get are a perfect match for you and your swing. PING is the innovator of club fitting and today I dive in and explain the PING fitting process for irons. PING was the first company to take club fitting seriously. In the 1960’s, founder Karsten Solheim realized he could help tour professionals by calibrating their equipment to fit their particular build and swing. Many of these players went on to play extremely well or even win at the next week’s event. With that early success, he went on to develop PING’s famous color coding system, which designated a particular color code for irons at a certain lie angle. This simple system has evolved over the years to the complete PING fitting process used today. It all starts with the interview. The interview covers many aspects of the player’s game. A player’s current handicap, how far their 7 iron travels, current and desired ball flight, and possible set configurations help narrow down the 10 million+available iron combinations. The final step is an inventory of the player’s current clubs and any likes or dislikes about them. After the interview is completed, the fitter recommends a PING model based on the answers. There are three types of models: the compact iron, mid-sized iron, and over-sized iron. Each model provides varying degrees of workability, forgiveness, and trajectory. Finding the correct combination of these traits gets the player in the best model to play better golf. Once the model is decided upon, the player undergoes a static fitting. Fitters use a combination of the player’s height and measurement from their wrist to the floor. 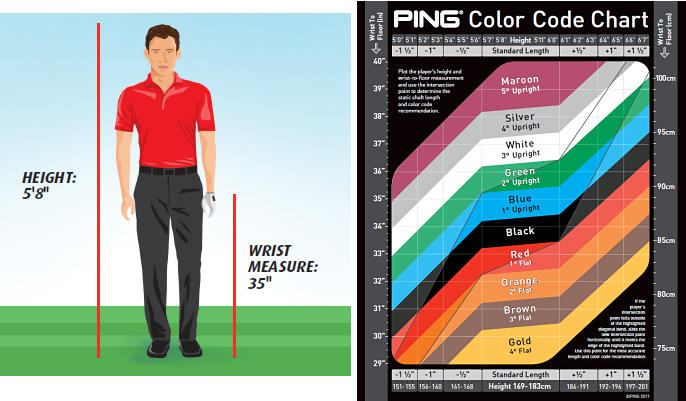 From the information, PING’s color chart will recommend a length and lie angle as a starting point. These two steps greatly narrow the number of options and get the PING fitting process started in the right neighborhood. It’s time to make an initial shaft selection. PING is on top of this thanks to its comprehensive chart (above). 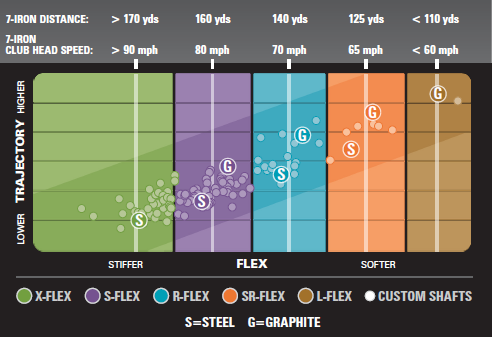 The chart shows recommended flex based on how far a 7 iron is hit and the different trajectories provided by each of their available shaft options. Again, this provides a great starting point for the fitter. Now that the static fitting has been completed, a dynamic swing test is performed to fine-tune options. After all, every golfer sets up and swings slightly different so these variations have to be taken into account when finding the perfect match. Determining the lie angle of a club shows where the club hits at impact. Heel-side impact causes shots to go left for the right-handed golfer. The opposite is true for toe-side impact. For the test, the fitter places impact tape on the sole of the club. The player swings at a ball sitting on a hard plate, making sure to hit the plate like they would the turf. 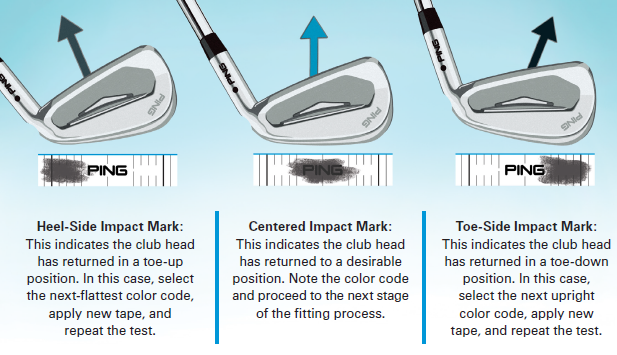 Fitters adjust the color code up or down until the impact mark is centered. Next step, dialing in the length. Refining the shaft length is easier thanks to the static fitting done earlier. The goal is to find the length that provides the most consistent contact in the middle of the club face. The fitter puts impact tape on the face and has the player hit several shots. Analyzing the results, the club may require going up or down from the recommended length established in the static fitting. The penultimate step is deciding the best combination and set makeup. The set makeup is determined by looking at the distance gaps between clubs. 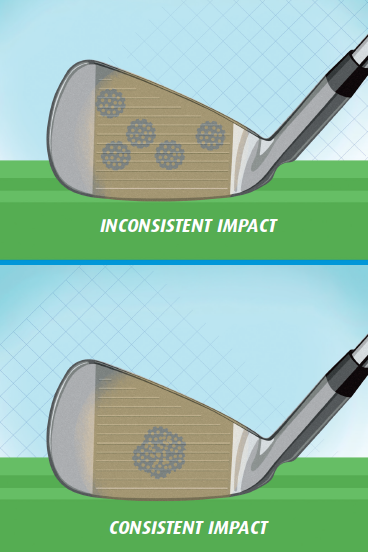 For example, if a player hits their 4 iron nearly as far as their 3 iron, replacing the 3 iron with a 3 hybrid gets a better distance gap between clubs. The final step is deciding on a grip type and size. 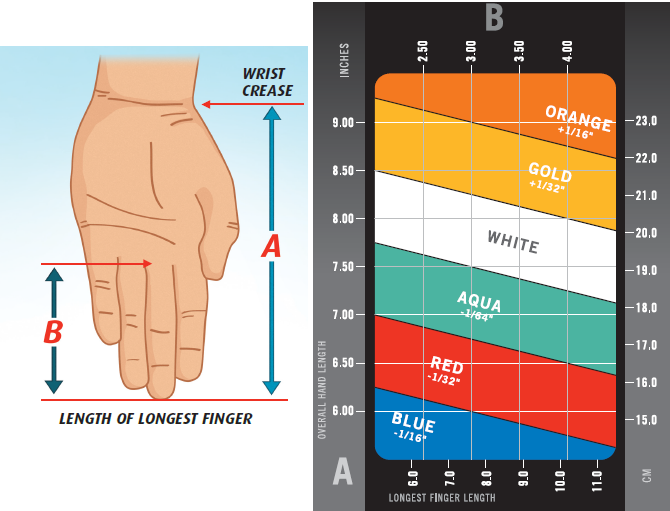 Grip size is determined by using the chart above. Fitters cross-reference the overall length of the hand with the length of the longest finger. The result is the ideal grip size for the player. The grip type will be primarily driven by player’s preference in feel and firmness. 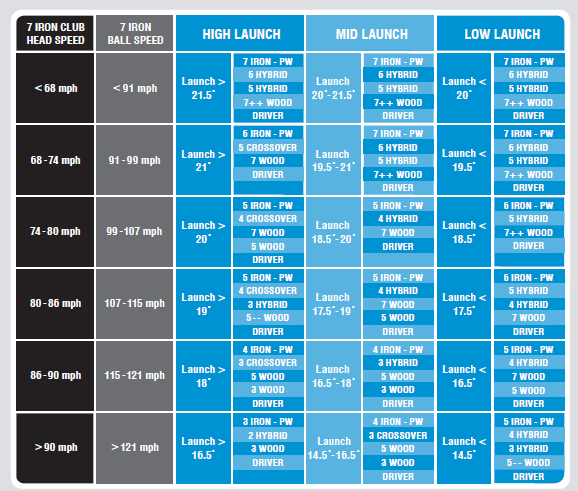 And there you have it, a comprehensive look at the PING fitting process for irons. It sounds tedious but it’s well worth it. The benefits of properly fit clubs will bring much more happiness and success.